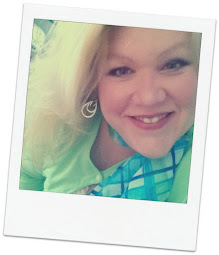 ALL of the content on this page is originated and authored by Vonna Pfeiffer, The Twisted Stitcher. These tutorials, tips and techniques are given freely for all to use. When using ANY part or piece of these tutorials in your own work, (i.e. if I have taught you to finish the item or part of the item) then crediting my name is the accepted way of "giving credit where credit is due". I expect nothing more than simple credit to my body of work. Thank you. I left mine the same size as they come in which is roughly 8 1/2 x10 inches. If you need significantly smaller than cut them to the dimensions you need, however, the size they come in fit small and large head magnifiers - Keep it simple! 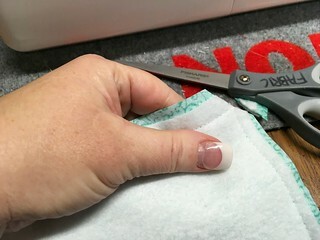 choose the cotton fabric you would like your magnifier cover to be in and cut it 1/8 inch larger on the top and sides of the felt piece, leaving 1 1/2 inches of fabric on the bottom. 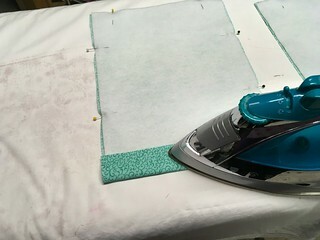 Fold over the 1 1/2 inch end of fabric over the top of the felt and iron into place. 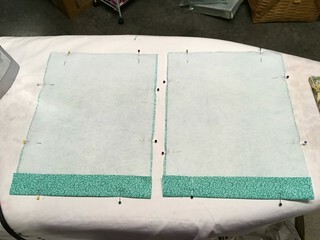 Pin the ironed bottom into place. 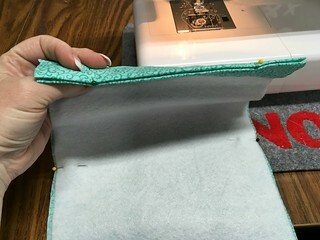 Go to sewing machine and sew along the edge of the folded end. 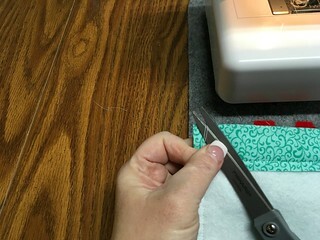 Sew sides and top - DO NOT SEW BOTTOM OPENING! 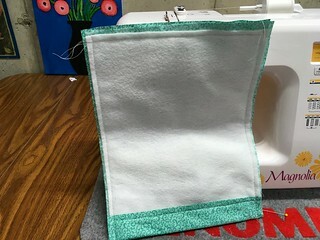 *hint* at the beginning corner, sew a few stitches forward, then a few stitches in revers (going back over the few forward stitches) to lock the stitches and reinforce edge. 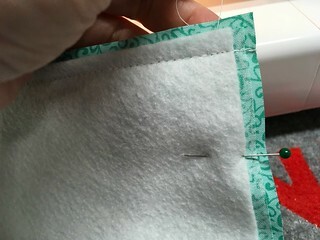 at the end of the side...run the stitches right off the edge of the fabric, cut threads, turn, load up and stitch along top of cover sewing right off the edge again, cut threads, turn and sew along the side of cover, reinforcing the last corner seam on the edge as shown above at the beginning corner. 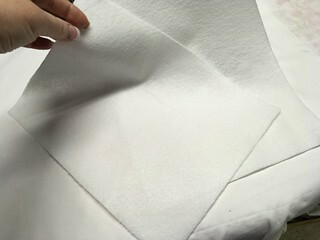 Take your points turner tool and poke out the corners until very pointy and crisp. 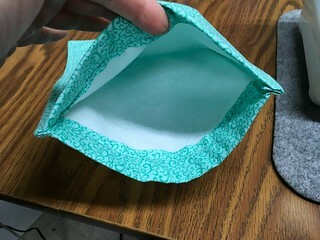 YOU know how I feel about crisp corners! 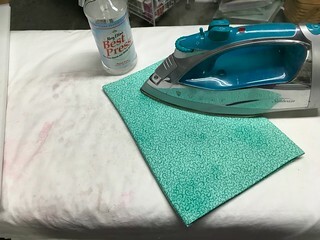 Take the cover to the ironing board and Best Press the heck out of it with a hot iron. 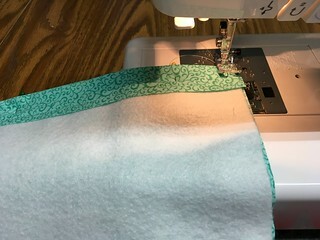 Go back to sewing machine and lengthen your stitch. 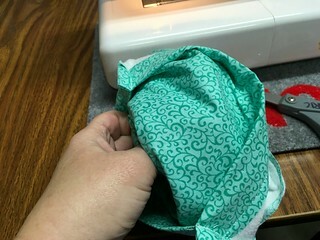 Because we are sewing through a lot of layers and lengthening the stitch allows the feed dogs (that grab the fabric underneath) to run a bit smoother pushing the layers of fabric through easier. *OR if you have a walking foot use it! 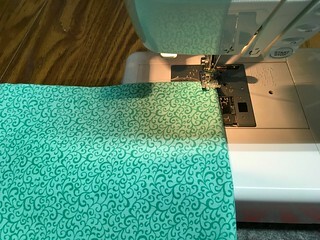 I have one and use it with larger projects, but my machine is superior with thick layers...one of the things about this machine that I love! 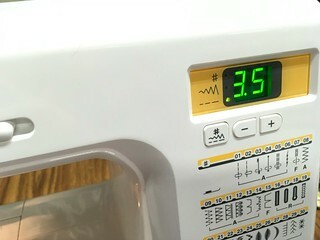 My Machine? 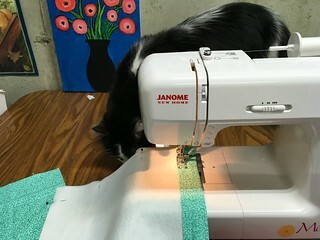 you ask: Janome Magnolia 7330 - I have two of them. I LOVE them! 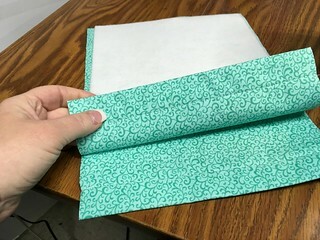 We are going to top stitch the cover to make it not only pretty, but doing this will make it durable and hide our raw edges - this is called "French Seams". 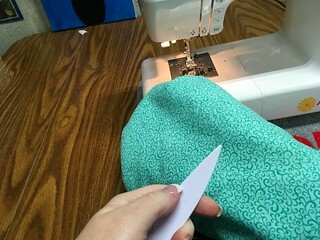 Load up your machine and start sewing. 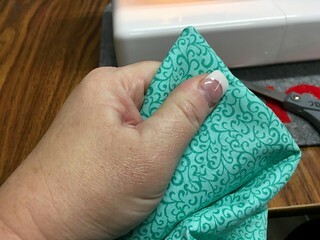 *hint* when you get the corner, STOP about 1/8 of an inch from edge, turn and then line up your presser foot and sew along top edge...DO NOT run off the edge of the fabric. 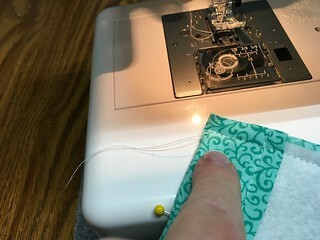 *hint* don't forget to clip your thread tails! 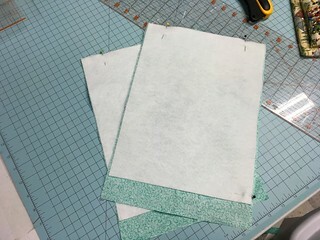 Cover your magnifier head...now it's all protected! 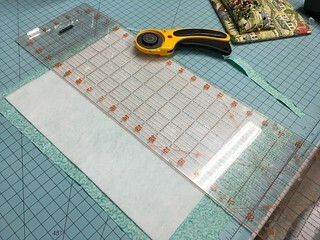 USE it when you are done stitching EVERY day! 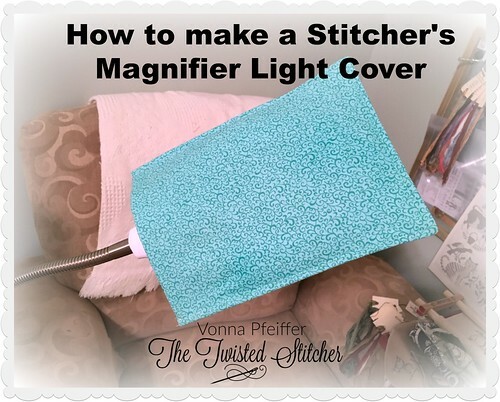 All of these methods, techniques and tips are tried, tested and used by myself (Vonna Pfeiffer, The Twisted Stitcher). 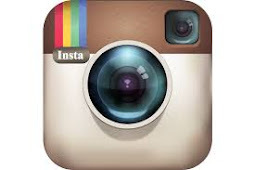 I am not advertising for any person, product or company. Any products featured in these webpages were purchased directly by me for the intended purpose displayed. 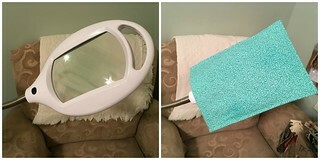 I have tried many products and these are the ones I choose to use and find superior. I will give you ideas, in the tutorial, on where these items can be purchased, if appropriate. 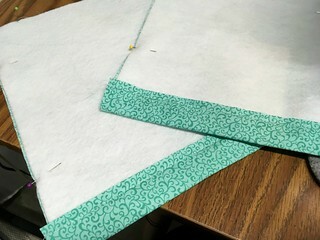 These techniques, of course, are not the only way to finish a project. 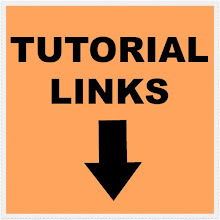 There are many other ways and many other tutorial blogs on the internet that can give you visual and instructional methods showcasing a different way and different method in which to finish an item. 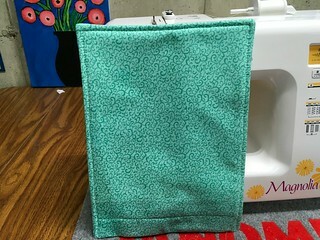 I am in no way self promoting myself, this is the way I do it and wish to share what I have learned through trial and error with others that may be struggling with finishing and finishing technique. In other words, my way is certainly not the only, correct way to do it, merely it is the way I do it. NOTICE: I am the author of these tips, techniques and photos and as such it is plagerism to take my words, my pictures or my work and make them your own. Please refrain from doing so. Give credit where credit is due...if you use my techniques, please link to my blog to give me the credit for sharing it with you. Finishing is not hard. There is no magic. There is not a "right" or a "wrong" way to finish. There is no "natural" ability involved with finishing. Simply anyone can do it. What makes finishing perfect each and every time is simply time itself. My tutorials were authored in steps with pictures so that anyone can sit down, start finishing and if needed may get up walk away and then come back pick it up right where you left off. 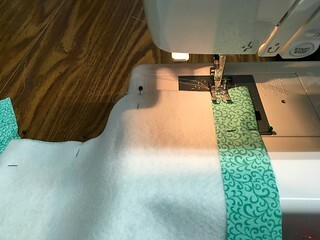 Remember: stitching a beautiful project is not a "QUICK" process...it too takes time.....so take some time and care in your finishing. 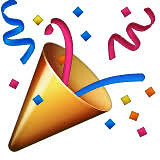 You'll thank yourself afterward!